KYTHIRA ISLAND, GREECE Is the most southerly of the Ionian islands; was the mythological birthplace of Aphrodite, who was said to have emerged from the sea here; this was the ancient center of worship of this goddess. Kythira, also known as Kythera, Cythera, Cerigo or Tsirigo, is an island, one of the Ionian Islands. It lies opposite the eastern tip of the Peloponnesos peninsula in Greece. It has an area of 284 square kilometers. The rugged terrain is a result of prevailing winds from the surrounding seas which have shaped its shores into steep rocky cliffs with deep bays. 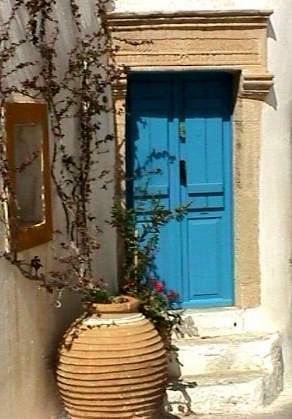 The island's architecture is a blend of traditional, Aegean and Venetian elements. At the start of the second millennium B.C. it was a Minoan colony and in 424 BC it came under the sway of Athens. Over the centuries it knew a succession of conquerors from the Romans to the Byzantines, Venetians and Turks, and it was frequently looted by Barbary pirates. In 1864, the island was reunited with the Greek state. Like many of the smaller Aegean islands, Kythira is depopulated. Its present population hovers around 2,500 people, but the modern Greek diaspora has produced perhaps 100,000 Kythiran descendants in Australia alone. The capital of Kythira island, Hora is located on the southern part of the island having no ports connected to the southern Peloponnese or Vatika. Kythera's port for Viatika is in Agia Pelagia Kythira. Kythira is served by daily flights to and from Athens Airport by Olympic Airlines journey time is approximately 40 minutes. There are also daily connections by boat car ferries to and from the Peloponnese and several connections to and from Crete. In the summer period there are also fast hydrofoil connections directly from Piraeus port of Athens.